We reached out to schools in Beijing to ask who was making an impact on their school communities. Our terms were loose, as we were curious about individuals who made a difference in leadership, community, and charity. We don’t feel like someone necessarily has to contribute to charity to be a community star, as sometimes a great, reliable friend in a school community can make just as much of an impact. Each of these stories is special, and we’re so proud to have had the chance to talk with these students and teachers. One of Keystone Academy’s foundations is valuing and expressing Chinese culture. Perhaps to some, that might not seem hard to do, as the school is situated in the capital of the country. But in fact, elements of traditional Chinese culture in Beijing erode or change with each hutong that’s brought down and mall that springs up. Though modernization isn’t necessarily negative, even foreign parents typically desire that children have a strong understanding of their own root culture and family. Alex (top left) is nominated for writing, directing, and organizing a student-led Chinese language drama at Keystone Academy. He poses with other members of the Wu Kong cast. They thought carefully about the emotions expressed by each character. They both stressed the necessity of the audience grasping these emotions to understand the crux of the drama. But this necessity became a source of conflict in leading and organizing the drama. “In reflection of planning for this play, I saw that I was angry and quite stubborn,” Alex said. Though there was excitement and dedication, since this was a student-led drama, they still had to handle unexpected issues. “At the last minute, soldiers suddenly said they had to drop out because of math exams, so I had to go from one dorm room to the next to try and find replacements,” Alex said. Of course, though they organized and encouraged others in their roles, they wanted to add they couldn’t have done this alone. “Both Ms. Pai and Ms. Lee helped us so much, especially in analyzing Wu Kong’s biography, and it was a group of us, about four other students, who really took on this project to organize the drama,” Alex said. Readers can see this drama at Keystone on April 21-22 at 6.30pm. RMB 50 (adults), RMB 20 (children 12 and under). Visit www.keystoneacademy.cn to purchase tickets. 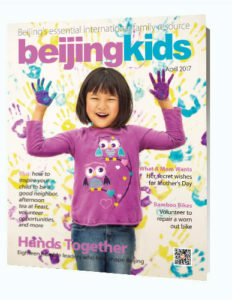 This is an updated version of the article that originally appeared on p. 30 of beijingkids April Issue.